Built In Thermal Overload Protection. 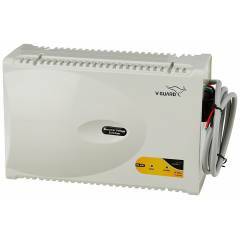 Delivery time was good and product is working nicely as of now., Vguard did it again, good & powerful voltage stabilizer. 2 of 3 users found this review helpful. Was this review helpful? Wanted stabilizer since long, thought of bluebird but did not find it satisfying as had earlier clubbed with my other electronics. However, I am satisfied with v guard, great value for money. 3 of 3 users found this review helpful. Was this review helpful? Stabilizer is good, working well from last 5 months. Excellent product from V-Guard. I can connect my LED TV, set-top box, home theater, and playstation. 4 of 5 users found this review helpful. Was this review helpful?